I thought I had better put ‘pen to paper’ and share some words about the swim too. I have been delaying this, and am still finding it quite difficult sat here now, two weeks after. Since finishing, I have been very protective of my swim. Now that it is over, after two very hard years of training, it feels like a part of me is missing and I have somehow lost a little bit (ok, a large bit) of my identity. Initially, every time I talked about the swim it felt like I was loosing a part of it, which made me feel very protective of it, however, I have realised that actually, by talking about it I can relive all the memories and the challenge and keep the swim going. I am incredibly pleased to have had this experience, and while I find it hard to put into words, because I don’t think you can fully express it, it has to be felt, I will try my best! Initially my tide was booked for the 13th – 19th August with the wonderful pilot Eric Hartley, on Pathfinder. Due to good weather and other swimmers being able to go on the neap tide before mine, I received an email from Eric, at the end of July, to see if I could move my swim forward. Thankfully, I had been prepared for this. I did not want to miss an opportunity for good weather, by not being ready, so I had already packed my kit and spoken with crew the week before. I jumped at the chance to swim early because it removed the uncertainty and anxiety of waiting in Dover for good weather. Swimming early does have implications for crew though. Jenny and Llyr were incredibly flexible and I was lucky that their work had allowed them to have the time off at short notice, so I knew they would be able to make it. I didn’t want them to be under pressure to have to crew with just the two of them though, so needed to find some other willing volunteers. Thankfully help came in the shape of Rachel and Martin. I will be forever in debt to my incredible crew, who did not falter for the entire swim and without whom I would not have made it to France. 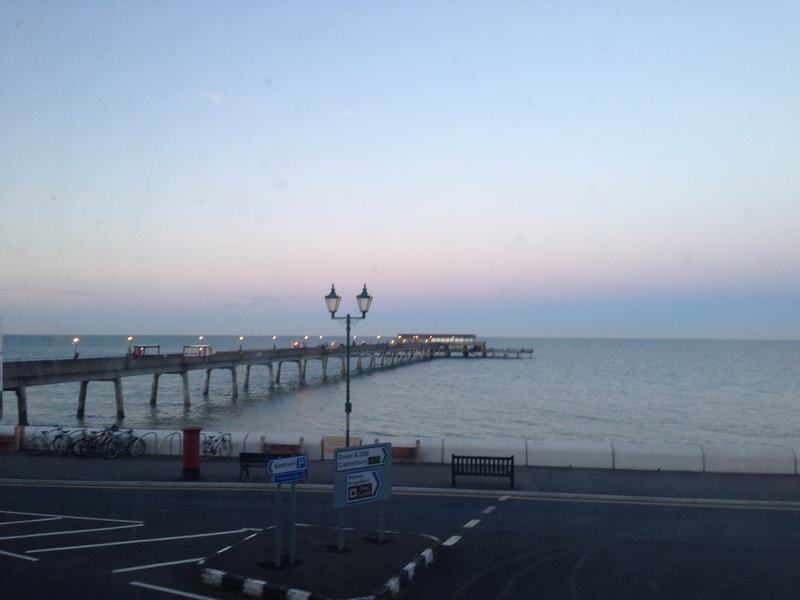 We traveled down to Dover on the Saturday afternoon and arrived early evening. 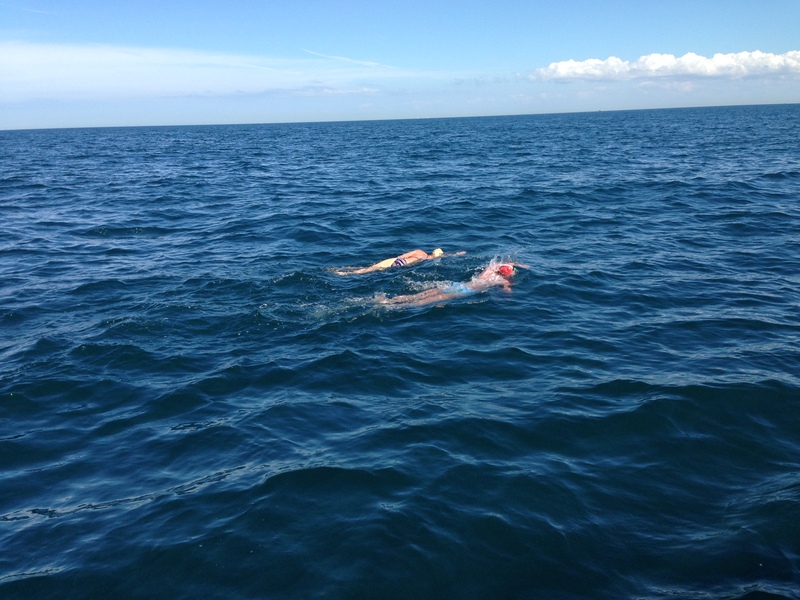 I was determined not to be overwhelmed by the enormity of the occasion and so deliberately kept thoughts of the swim locked in boxes, inside my head, out of reach – and actually left them there until way into the swim. This meant I was able to enjoy a really lovely evening and Italian meal with my crew, feeling relaxed and calm. We hit the sack early and I was thankful to get a very good nights sleep, unfortunately I don’t think the same can be said for all of my crew. As everything was already packed, all we needed to do in the morning was refill the hot water flasks, cover myself in sun cream and eat a good breakfast. My lights were already attached to my costume and it felt a real privilege to be wearing the names of such inspirational people and to be able to honour them with this swim. We got to Dover Marina early and were very amused when Jenny was pooed on by a seagull in the carpark, it’s good luck after all! Still feeling calm, I focused on things that needed doing and kept my mind very much in the present, not thinking about what lay ahead. Boarding the boat I was clutching a little plastic bag that had my cap and goggles in (with lights already attached) and I watched as my crew loaded all the gear onto the boat. After quick introductions and a safety briefing from Keith, the CSA observer, we left Dover Marina and headed around the harbour walls, past Shakespeare Beach towards Samphire Hoe, where I would be starting. As soon as the boat was moving I began to start greasing up, first a thick layer of Sudocrem (that made me look like ET) followed by an extremely thick layer of Vaseline over the top. This was to prevent chaffage, rather than for warmth. 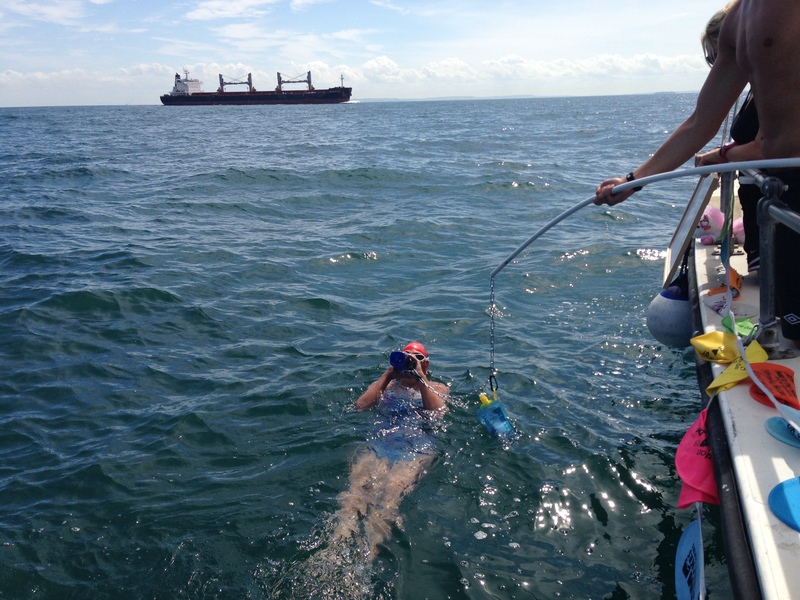 One of my ‘concerns’ about the swim was having to jump from the side of the boat into the sea, because this generally causes my goggles to come off and fill with salt water, affecting how well they seal and my visibility. So I was really pleased to hear Eric say, “Over the side or down the ladder?” This choice did leave me with the sound of “wimp” ringing in my ears as I descended the ladder though! The sun was shining, the sea was calm and the water temperature felt comfortable as I began my strokes towards the beach at Samphire Hoe. I was smiling because I couldn’t wait to start and finally get my shot, I felt so lucky to actually have the chance to achieve my dream. To swim the Channel. I thought about all the people who would like this opportunity but the weather is never right or their circumstances change and I felt privileged to be given the chance. Scrambling up the pebbles onto dry land I looked at the boat and concentrated on the fact that all I had to do was swim out to the boat, easy. I didn’t allow myself to think any further ahead or greater than that. Just to the boat. On the way to the boat I told myself it was a fantastic idea to ‘practise’ my swim before it actually happened. This really relaxed me and helped me get into a comfortable rhythm without being overwhelmed by the enormity of what lay ahead, and the pressure of everyone who was following, supporting and had expectations of me. I didn’t need to worry about those things because they aren’t relevant on a practise swim. This was just training and I’d been completing and enjoying training swims for two years, so why would this be any different. It’s just another swim. Heading out from Samphire Hoe I had initially been aware of another boat, Louise Jane, piloted by Andy King. This soon disappeared from view behind my boat Pathfinder though. It was comforting to think that there was someone else in the water swimming too, until I saw Louise Jane go flying out past the front of Pathfinder. Wow… Either they were swimming really fast or I was swimming really slow. Either way it didn’t really matter as I knew we would both have our own challenges ahead and thinking about someone else’s swim wasn’t going to help mine. So that was the last I thought about Louise Jane and her swimmers (until the very end when she would play an unsuspectingly wicked role in my journey). Occasionally I would see them on the horizon or to the far side of Pathfinder to me, but they just became another boat. One of many that we would see across the Channel. When my crew put the bunting up around the boat I could have cried. It just looked perfect and somehow seemed to make the boat smile. To see the rainbow of colours and swim history every time I breathed to the right made my skin tingle. It was such a honour already to be swimming with the names of wonderfully inspirational people on my costume (some of whom had dreamed of swimming the Channel themselves but been denied the chance when they lost their battle with cancer) that seeing the bunting really humbled me. I knew that each hat had come from someone who was willing me across and that the dedications and stories they represented were far greater than anything that stood between myself and France. Hats sent on behalf of 18 month old babies fighting cancer, Channel swimmers who had spent 18+ hours in this water, friends who had lost loved ones and people who had overcome fears and barriers to take to the open water for the first time. If you sent in a hat, thank you! You were there and your presence was like a magic that surrounded the boat, it made me smile and gave me strength. I will be auctioning / selling the bunting in September, in sections of 6 hats, to raise further funds for Cancer Research UK but at the moment I’m not ready to part with it. Initially, although I was feeling relaxed and calm, I was very focused and particularly wanted to make sure my feeds were quick and efficient. I was polite with the crew and always communicated and responded to their questions but this was often just a thumbs up rather than words. Talking requires thought and thinking is not a good idea when you are swimming the English Channel. I was pleased to have practised my feeds in Salford Quay, before the swim, and Rachel and Martin did a fantastic job at every one of my feeds. 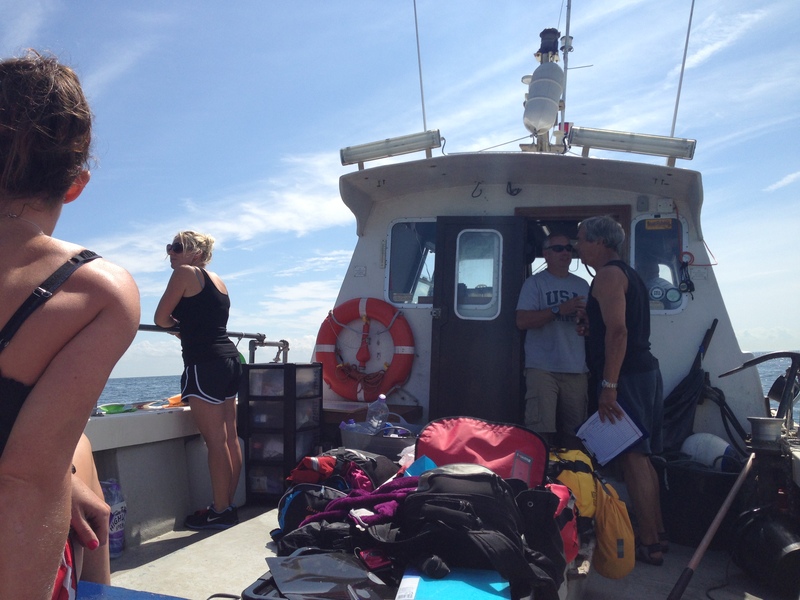 After a couple of hours I had relaxed more and would respond verbally and crack jokes with the crew. I loved hearing the messages of support and seeing the fundraising total written on a whiteboard by the side. Feeds were also an opportunity to share my stroke rate with me. I never asked how far we had gone or how far we had left and my crew knew not to talk about these things with me. I swam an hour before my first feed and then fed every half hour throughout the swim, until the last hour when my crew made the wise decision to reduce them to 20 minute intervals to give me a boost. Every feed I had 300ml of Maxim (carbohydrate powder), made up as half Maxim and half hot water. Every other feed I was also offered something solid. On EVERY long swim I have ever done I have practised this and loved nothing more than seeing a Jelly Baby hung over be side of the boat or being handed a Jaffa Cake, coming in to feeds in Dover a Milky Way was heaven! In the Channel though, for some reason, I just didn’t fancy them. I wasn’t ill, they just didn’t appeal. So sometimes I wouldn’t eat them, which was fine, because I always drank all of my Maxim, the solids were just a bonus treat. I did really love the fruit I had. Little pots of pineapple or mandarin in juice, they cut through the salt and soothed my mouth and throat. The mouthwash was also very much appreciated and I had this after every feed, from about 4 hours onwards, and would swim away from the boat with a happy, minty glow! At times there were changes to feeds and my crew were excellent at responding to this, a cup of lemon and ginger tea was a welcome break when the Maxim started to make my tummy nauseas, flat coke added a boost when extra speed was needed to break a tide and, after 7 hours, painkillers were occasionally added. I thought I was doing a good job of keeping my feeds to a minimum amount of time but watching them back, in reality, they were longer than they felt at the time. After my swim, when I found out that I was only a mile from Cap Gris Nez when the tide turned against me, I wondered if scraping extra seconds off each feed could have meant I reached the Cap before the tide turned, but this was pointless thinking, because the swim was done! So, I kept my head down and swam… And swam… And swam. Because, funnily enough, when you are swimming the English Channel, that is all you have to do… Swim! There were some MASSIVE jellyfish, Lion’s Manes and other species I can’t name, that looked like the moon stuck on aliens. They had tentacles that must have stretched well over 5 or 6 metres long and the domes on others were pushing a metre in diameter. Thankfully their size made them relatively easy to spot and swim round and many were at a depth I wouldn’t like to estimate. I did get stung but only two or three times and nothing that counting to 100 couldn’t distract from. There was some boats and some seaweed and bits of metal floating in the separation zone, but no raw sewage and nothing that hurt or hindered me. Which I was grateful for. The sun continued to shine and the wind was blowing but the waves were ok to swim through and I was grateful for this too. 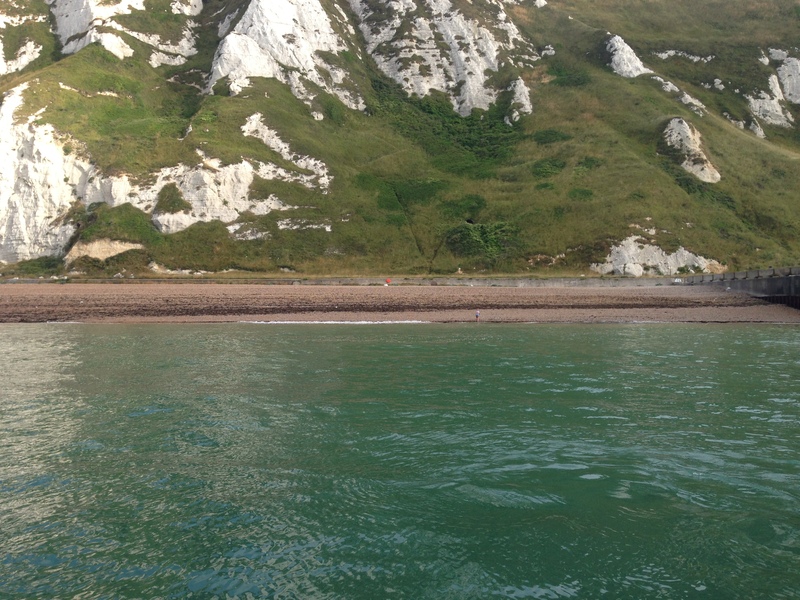 The white cliffs of Dover seem almost omnipresent when you are swimming the English Channel. I deliberately didn’t look behind or infront of me, just at the boat to the side, even so, you can’t help but see the cliffs. They loom huge and beautiful and mysterious for hour after hour never fading or getting smaller. 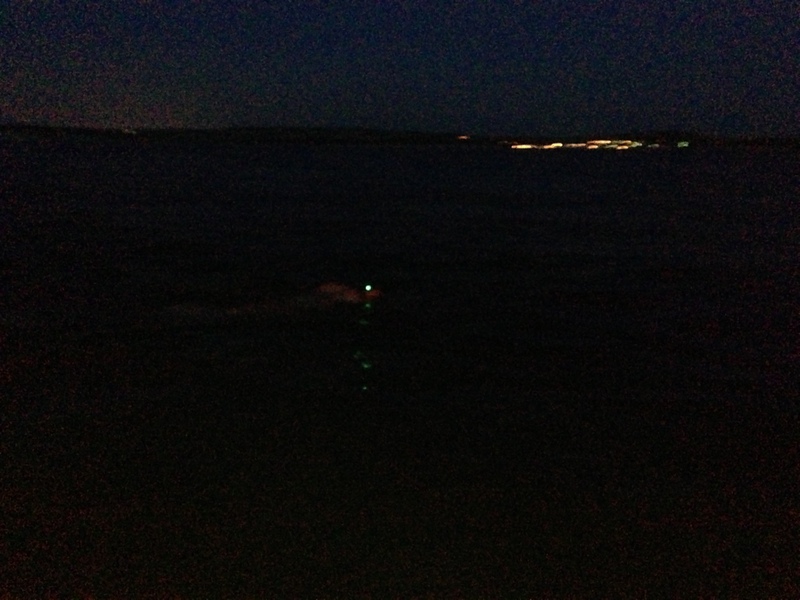 But I knew from my relay and crewing for other solos that they would eventually disappear, as long as I kept swimming. After 6.5 hours (although I had no idea how long it had been at the time) I remember asking myself why I was doing this, the pretence that this was a practise run had long worn off but I had been doing a good job of keeping my mind in the present and enjoying the journey, rather than focusing on the end point and the goal (something I had practised many many times during my visualisation sessions in the float tank). I always knew this question would come at some point during the swim and there were many answers I knew I could choose from. I mainly talked to myself about the fact it was fun, I LOVE swimming, particularly in the sea. It is my place of peace and inner calm. It’s where I feel most myself. I reminded myself that this was an incredible place to be and a real adventure. I thought about being in the water on my own, with my crew on the boat, and the fact that this wasn’t really a ‘solo’ because they were pivotal to my success and that this was their swim too. I really wanted them to fully share in the experience and feel for themselves what it was like in the water. So at the next feed my crew were surprised when I asked for someone to get in the water. Keith (the observer) laughed when I said “This is supposed to be fun and it’s no fun on your own.” I smiled telling them that I wanted everyone to have a turn in the water – which I new Rachel and Jenny would be happy about but that it would take Llyr and Martin well out of their comfort zones. Jen came in at the next feed for an hour and it is was amazing. Swimming alongside her and seeing her face and reaction when she saw the humongous jellyfish too was really special. Jenny and I have swum together in Open Water for three years now, we met on my first ‘proper’ open water swim for the length of Coniston and she was my inspiration for the Channel. So it felt right, and brilliant, to finally be swimming stroke for stroke, side by side in this very special stretch of water. The others all did half an hour each over the course of the swim. Llyr provided a lot of entertainment as he tried to swim his usual 100 strokes a minute at my pace, Martin (who had done very little open water swimming before) battled against the worst waves of the swim with me and Rachel looked like she was going to explode, with a stroke rate over 90 desperately wanting to not ‘slow me down’. I am so glad I made the decision to have them in the water with me. It has meant so much to fully share it with them and to know they can say they were part of the ‘swim’ too. We were very much a team after all. I am incredibly lucky that my crew were outstanding. They didn’t complain about my ‘swim-zilla’ control freak nature or the weighty tomes of ‘Crew Instructions’ that landed in their Inbox in the days before the swim. They completely respected and stuck to my requests throughout the entire swim. There was ALWAYS someone looking at me and encouraging me, no one put warm clothes on in front of me, only one person spoke to me at a time and they motivated and encouraged me for each of the 845 minutes of the swim. I could not have done it without them and I do not have a single complaint or moan to make about anything they did or said. They were truly exceptional. As the sun began to set it reminded me just how long I had been in the water and indicated that we were going to be swimming into the night… And the dark. The sunset itself was breathtaking. Absolutely stunning. And was the perfect backdrop to the Cap, as it loomed in the distance. As opposed to the very frustrating French coast line which had been running along my left side for hours. I couldn’t help looking at it, unless I closed my eyes when I breathed that way, because we were moving parallel to it… Slowly! I didn’t know at the time but the tides had been much stronger than anticipated and had continued to run for longer than predicted, carrying us much further up the coast than intended. Not too much of a problem, because when it turns it carries you back again, but, unfortunately for me, when the tide did turn so did the wind. As they were in opposite directions this picked up the wave and chop and also cancelled out a lot of the beneficial effect of the tide… If I was going to get to France, the tide wasn’t going to take me there… I had to swim back against the wind. And then, as the end point became only a mile away, the dark set in and the tide turned again, to start pulling me away from France. I felt it turn. I felt how strong it was and I dug in, pulling harder and strong with my arms as much as I could. Aware that I could still have hours left I was trying to give everything I had while still leaving enough reserves in the tank. Hard to judge when you have absolutely no concept of distance or time to the end!! At one of the feeds Jen passed down my clear goggles and took my tinted ones. Having swum with both pairs numerous times I was utterly confident with them, knew they sealed and would be comfortable. So I was very confused and annoyed when my clear pair were pushed on and completely filled with salt water, stinging my already very tired eyes. I rolled on my back, kicked (not wanting to loose any ground to the water) emptied and resealed them. But they filled straight away again. And again. And again. I finally relinquished and just swam with them full, cursing my crew privately in my head, for being careless enough to get grease on the seals. As it turned out they had done no such thing, of course! But after 12+ hours of wearing the others my eyes had deep marks from their seal, which changed the shape of my face and prevented the clear ones from sealing as normal. Thankfully after a feed I emptied them and they adjusted enough to keep the sea out. Unfortunately this was about the time that I started to fill the goggles with salt water of my own, from the inside anyway. The dark didn’t bother me at all, in fact France, and the boat and the crew all looked quite pretty lit up against the jet black and the twinkling stars. I wasn’t sick, I wasn’t cold, I wasn’t tired, I wasn’t in too much pain, I was still swimming. My stroke rate was good and my arms were still pulling strong strokes in the water, my legs were still kicking and the crew were telling me I was making progress and moving forwards. But mentally I started to break down. I didn’t full on loose it. 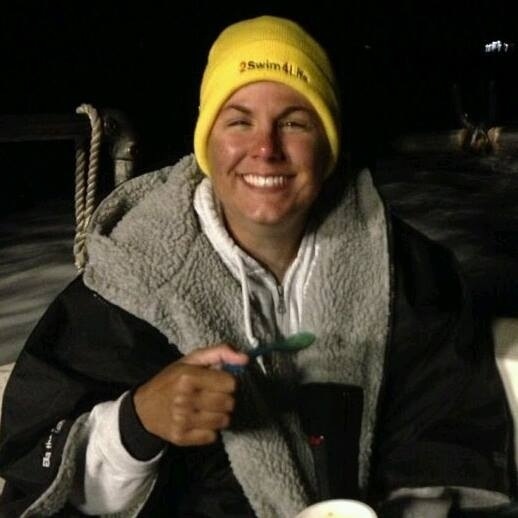 At no point did I stop swimming or want to, I didn’t ask how long left or complain, I still took all my feeds and was polite to the crew and I answered all the hypothermia questions fluidly. But the lights were playing tricks on me and the tide felt SO strong beneath me. I was reminded of all the numerous swims that had failed at this exact point and wondered if I was going to become one of them. I knew I would not quit but there were still many ways the Channel could beat me. I could see a light in the water that I took to be a buoy. I didn’t care how quickly I was moving forwards but was desperate to know that I was making some, any, progress forwards. However, at every feed the light was definitely getting smaller, meaning it was going further away and taking my dream with it. I would say to the crew that the light was moving away from me and that I was going backwards but they would just reassure me that I was moving forwards, as they thought I was talking about the lights on the land, which they knew I WAS getting closer to. 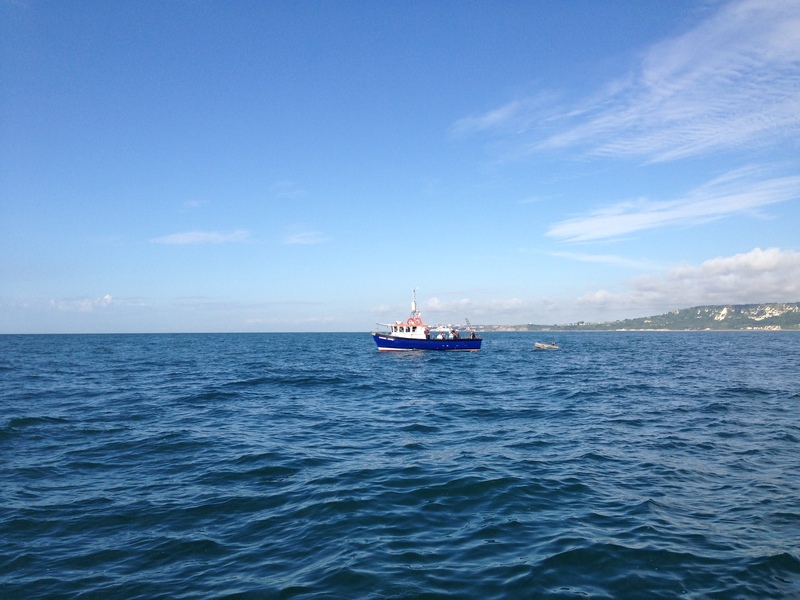 I only found out, back on the boat, after my swim, that the light I thought was a stationary buoy the tide was pulling me away from, was actually the light on top of the Louise Jane as the relay team she carried ploughed towards the Cap. I WAS moving forwards but they were just moving forwards faster!! It seems very silly now and was an easy mistake for me to make, but I broke the golden rule and it had started me thinking… And even worse… It had taken me out of the present and got me fixated on thinking about the end and where I was in relation to it. I cried. In fact I sobbed. Because this chink in my mental armour allowed the demons, which I had kept at bay, to leap forth and dominate my mind. They shouted and screamed “You’re not good enough to do this. You’re not fast enough or strong enough. You will never get to France because you are not good enough.” Etc etc I was crying because it was taking everything I had to ignore them and keep swimming and not let them affect my arms moving over my head. It didn’t matter as long as I kept swimming. I was NOT here to quit. And then Jenny leaned over the railings and said “Mate, are you ready to be a Channel swimmer? 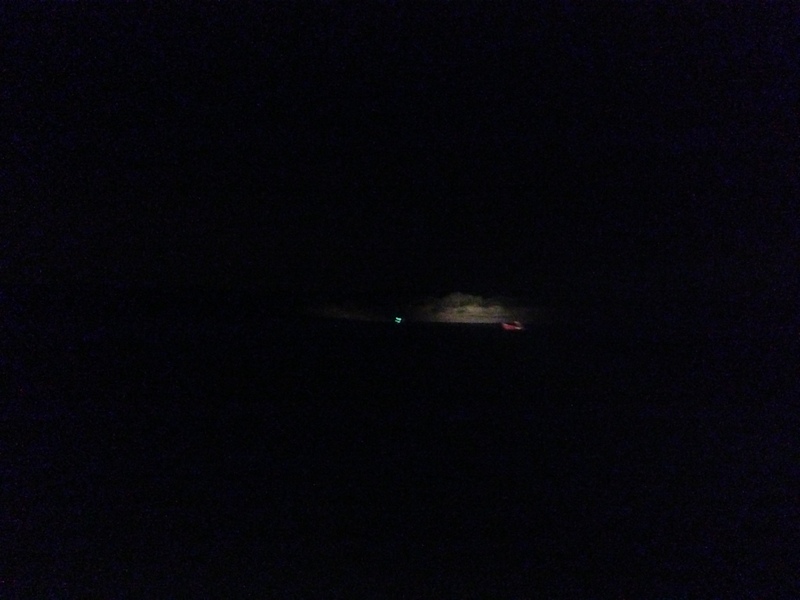 Because I’m getting in and we’re swimming to the beach.” And as she said it I looked in front of me, and from nowhere, lit up by a floodlight from the boat, was sand. I can not explain the feeling I had at the moment. There are not words. It’s brought tears to my eyes just to think about it now. Jen got in and shouted at me to stick with her. It burnt and hurt like nothing else to chase that beach and swim like I was in a 400m time trial after 14 hours already swimming. But we got to the beach and it overwhelmed me. It was like landing on my very own moon. And it was ALL worth it. All of it. On the way in we were stumbling and falling over rocks in the dark to get to the sand and I shouted to Jen, who was waiting behind me, that there were two people in the water to greet us. It was only as I ran towards them that I realised it was our shadows… Only to have a man come running out of the bushes, waving his arms and shouting welcome to France!!!!! We collected pebbles and swam to the dinghy, that took us back to the boat. I felt exhausted and happy and tired and delighted. I was a Channel Swimmer!